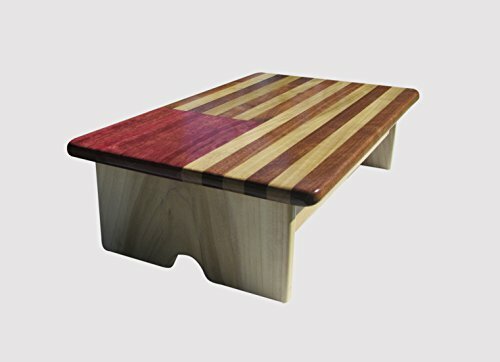 With its simple, handcrafted and attractively finished look, the Bedside Footstool is the perfect solution for that extra help into bed (if the person your buying this stool for is elderly or recovering from a medical operation please look for our Stability Bedside Foot Stool Maple Stain 6" tall). The footstool is well made, sturdy and reinforced to support the weight of the user for unlimited usage. Whether a young child or an adult, this 6-inch stool gives that intermediate step to help make that platform bed safer and easier. Stepping onto the stool with socks can be a little slippery, so for safety we recommend adding a tread strip across the top, available at your local hardware store. Customer success: I purchased one of your footstools from Amazon last week. From the beginning I was favorably impressed by the fine craftsmanship that went into the construction of the footstool. Now that I have been using it for a few days, I confirmed by initial reaction and find that it works well for my purposes. Thank-you for sharing your fine craftsmanship with me. Kirk Rogers is an American inventor who designs practical and attractive products for the enhancement of people's living spaces. Kirk Rogers has been an Amazon Top Seller since 2005 with over 500 inventions to his name. Search KR Ideas on Amazon for other ingenious storage, display and furniture products. All KR Ideas' products are original and fabricated in the U.S.A. If you have a specific problem that needs a design solution, contact KR Ideas and have them create a product tailored to your needs.